Stretching out across the Shandong Peninsula, Qingdao is a major seaport, naval base and industrial center of China’s Shandong Province. Translated as “Green Island,” Qingdao is a place with splendid sea views, fresh breezes and great seafood. Generally, the best travel activities in Qingdao are cited as follows: swimming in the sea, having a Tsingtao Beer, eating fried clams and climbing Mt. Laoshan. 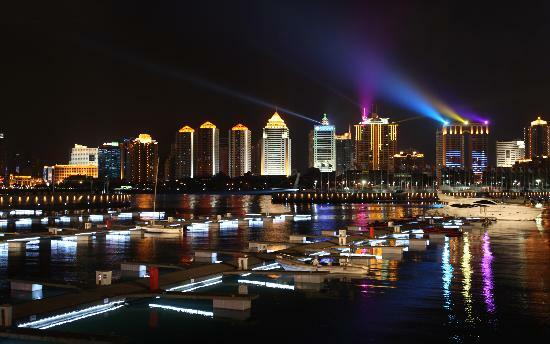 If you need a relaxed holiday, Qingdao is an option for you to explore. You will definitely be impressed by the mild weather, beautiful beaches and picturesque mountain views. What’s even better, is that many attractions across the city are free to visit. Let’s have a look at the top 10 attractions in Qingdao, China. 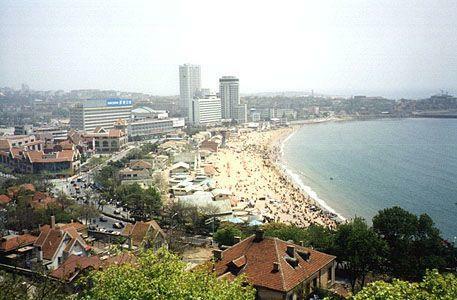 ShiLaoren Beach is one of Qingdao’s largest beaches. It was named after a prominent rock shaped like an old man extending into the sea, measuring 17 meters in height. It is said to resemble an old fisherman waiting for his daughter to return from beneath the waves. Lying on the beach, enjoying the sunshine, having a few beers, swimming in the sea, driving a speed boat or taking a walk along the beach are all at your disposal. This is an ideal place to spend an afternoon or warm summer evening. The Qingdao Protestant Church, built in 1910, is situated on a small hill, east of Xinhaoshan Park. Although recently renovated, this church still retains most of its original style and charm. Covering 1,000 square meters, it is a typical German castle structure composed of an 18-meter-high main hall and a 39.10-meter- tall bell tower. Visitors can have a birds-eye view of city’s sea scenery from the top of the tower. 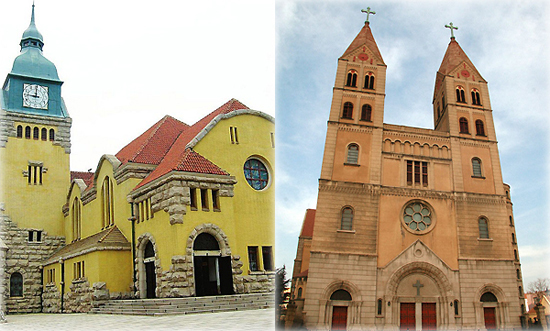 St. Emil Church, also known as the Qingdao Catholic Church, is the largest Gothic-style building in the city. It was designed by a German architect, based on the characteristics of Gothic and Roman architecture. The church is composed of an 18-meter-high nave which can hold nearly 1,000 people, and two 56-meter-high towering clock towers with elegant red spires topped by two gigantic Latin crosses. Built between 1932 and 1934, the church is considered an outstanding masterpiece of 20th century Christian architecture. 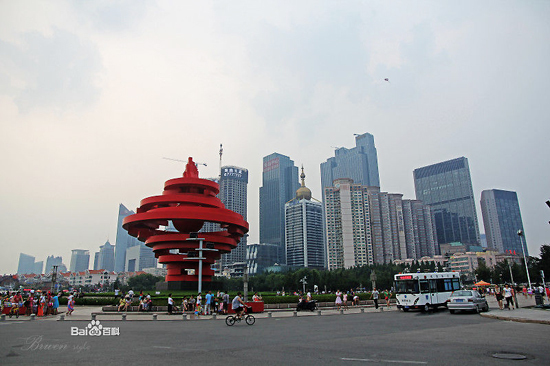 As a symbol of Qingdao, the May 4th Square got its name in memory of China’s historical May 4th Movement. Located between the municipal government building and Fushan Bay, it covers an area of 10 hectares. The most remarkable structure, located in the center of the square, is the spiral sculpture entitled “Wind of May.” All sorts of fountains are scattered across the square, providing it with some magnificent decoration. The nighttime views here are excellent. With the moist air and soft sea breeze, it is a wonderful place to go for a walk after dinner. The Qingdao Olympic Sailing Center, or the Qingdao International Sailing Center, is a sailing marina located on the former site of the Beihai Shipyard by Qingdao’s Fushan Bay in Shandong Province. The center was constructed for the 2008 Summer Olympics and has hosted multiple Olympic and Paralympic Sailing competitions. Wind conditions here vary greatly, from very light winds to +15knots. At night, a laser light show from the main breakwater lighthouse is on display from early evening to midnight. Located to the southeast of Zhanqiao Bridge, Small Qingdao Island is a pleasant little peninsular. From the sky, the island looks as if shaped like an ancient lute and hence has earned its nickname Lute Island. The island features a little park, a few small cafes and a white lighthouse. It is dotted with black pines and flowers such as oriental cherries, green peaches, pomegranates and roses of Sharon. It is a good area to go for a brief stroll, providing a good view of the Huilange Pavilion and a spectacular night view when the lights are all lit after dusk. 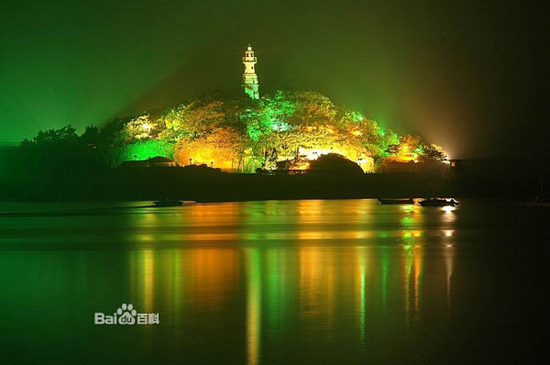 Weather-permitting, visitors can see the nearby Yellow Island (Huangdao) nestled in the mist. The No.1 Bathing Beach is located at Huiquan Bay, a fascinating location in Qingdao. Sitting on a beautiful coastline, the beach is 580 meters long and 40 meters wide. It used to be the largest beach in all of Asia. The gentle slopes, fine sands, crystal waters and soft waves are the four main features of the beach. The blue skies, shimmering ocean, red coral reefs and green trees make for a fantastic holiday picture. 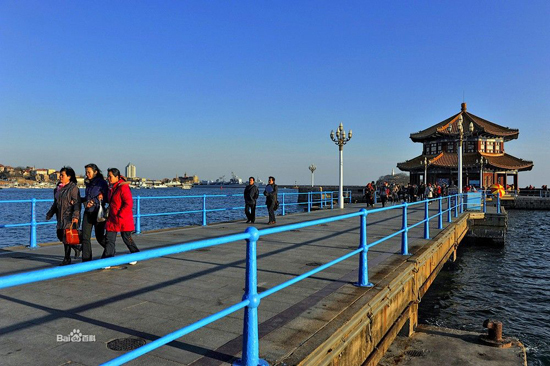 In addition to the May 4th Square, Zhanqiao Pier is yet another historic symbol of Qingdao. 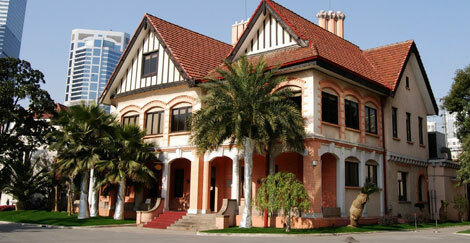 It was built in 1893 and used as a port when Qingdao was still a small village. Since it is very close to the Qingdao railway station, it is the most visited spot in Qingdao. It is 400 meters long with a pavilion called the Huilange Pavilion at its tail-end. 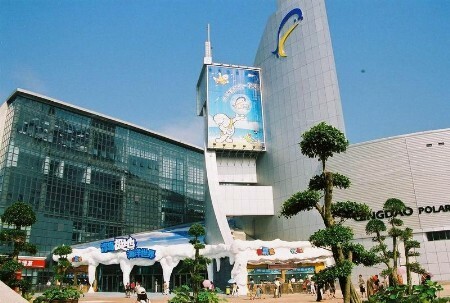 The Huilange Pavilion sometimes hosts exhibitions, but most of time it simply sells various kinds of sea products and ornaments. There’s a beach called “the sixth bathing beach” just underneath Zhanqiao Pier where you can enjoy the sunshine and go for a swim. Badaguan, or the “Eight Passes,” is a historical street district in the southeast of Qingdao, Shandong Province. The street is famous for combining the architectural styles of different countries. The name “Eight Passes” stems from China’s eight famous strategic passes: Jiayuguan, Juyongguan, Wushengguan, Ningwuguan, Shanhaiguan, Shaoguan, Zhengyangguan and Zijingguan. There are now 10 roads running across the district which crisscross to form a scenic area. Badaguan remains special to this day for its unique blend of Eastern and Western influences. As a symbol of Qingdao, Badaguan has proved attractive to many film producers and directors, as well as visitors from all over the world. With its highest peak rising up to 1,133 meters above sea level, Mount Laoshan is situated in Qingdao, on the southeastern Shangdong Peninsula. Facing the Yellow Sea, it is one of China’s major scenic resorts and has long held the reputation as China’s most famous mountain overlooking the sea. 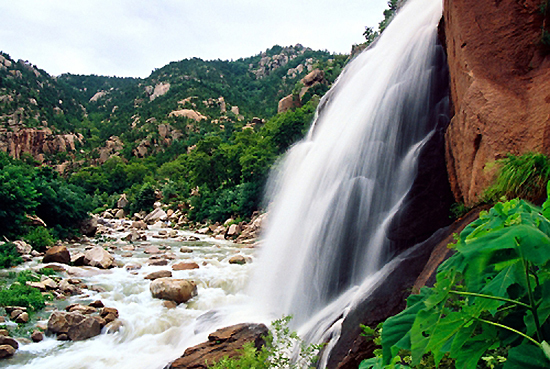 Mount Laoshan is a famous Taoist mountain boasting both mountain and coastal sceneries. 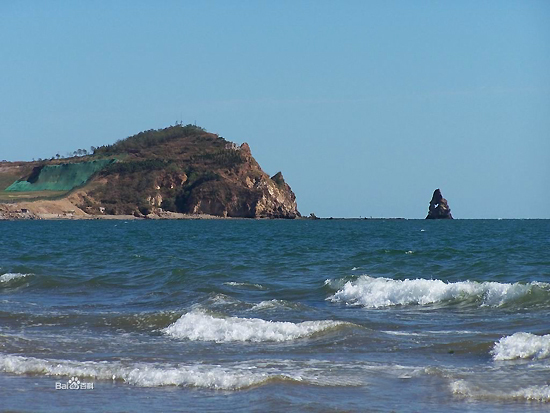 Among all the well-known mountains across China, it is the only one located on the coastline. It has a coastline of 87.3 kilometers (54.25 miles), including 13 bays and 18 islets. At the peak of Taoism in China, there were nine palaces, eight Taoist temples, and 72 nunneries, housing nearly 1,000 Taoist priests and nuns on the mountain. The Taiqing Palace is now the largest and oldest among the preserved Taoist establishments.